Detail: A recon shuttle containing Muppet and Sandman was despatched early Friday night to recon the flight path to Bundaberg, with reinforcements to follow early the next morning, departing the flight deck at 2am. A rendezvous was pre-arranged for 6am, at a suitable location just outside Maryborough, approximately 1 hours and 20 minutes from our target. Radio contact was established with the advance recon shuttle at the appointed time, and the rendezvous went without a hitch. The two shuttles then travelled the remaining distance in formation, utilising the radios to keep the crews entertained. A game of “Guess this song” was played over the airwaves, and it managed to make the time to target fly by. At approximately 7am we arrived in Bundaberg, and proceeded to a local food outlet to secure fresh supplies. The “McDonalds”, not only provided sustenance, but also had a free primitive information service available, called “Wi-Fi internet”. The troopers, currently in civilian disguise, utilised this information system to secure lodgings for the night, for the two advance party troopers. Once fed and refreshed, we proceeded to the main target. Upon arrival we scouted the area, and established contact with our local liaison, Cathy. We had a quick scout of the area we were to control, and the room provided as out base of operations. Once suitable attired, we proceeded to move amongst the crowd. The five of us were an impressive sight, and wowed ,any of the people at the venue, and scared many of the children. An intimidating sight, we continued to circulate, having many photo taken, and answering many questions about who we were, an d what we do. After a half an hour or so, we were asked to do a Television interview for the local Chanel 7. An Impressive sight, we should be able to obtain a copy of the footage for future records. Upon arriving back at the PCYC, we once again restored order, and proceeded to promote the empire. We continued this for a while, until a lunch break was called, and we retired to out base for a drink and some food. Once again refreshed, we were invited to a game of Laser Skirmish, against some of the indigenous population. Having the best technology and armour onsite, it was no doubt going to be a one sided affair. Upon starting, we realised the average age of our opponents was about 10 standard earth years. A walkover some might say, but given the 30 plus degree heat outside, out skills were going to be taxed. Added to the fact that our young opponents soon worked out that if they ran behind us, we could no longer see or hear them, and we had to change our strategy. Soon we worked as a team, covering each other’s backs, and holding a corner post against the onslaught of ewok sized opponents. Once the game was finished, I had a new found respect for our fellow trooper stationed on Endor. Having all nearly overheated from this, we retired once again for a drinks break, but were soon once again on the job. As things slowed a little in the afternoon, but the heat persisted, we tried to remain in the air-conditioned Gymnasium section. Although still a hot room, Muppet found time to do some colouring in, which he later signed and gave to a young attendant. Shortly after this, the day was getting on, so we retired to make ready to depart. Upon saying our goodbyes, we boarded our shuttles and made our way to our lodgings for the evening. Once there we retired to some serious team building and recruiting exercises as we sat in the pool sipping at exotic beverages. Once wrinkled from this, we moved on to a local cantina for more food, and were treated to many odd looks and questions about our shirts, what we do and who we were. Once the local population was suitably educated, we finished off out meals and retired for the night, as many of us had been up for the past 21 hours. The following day we moved off to investigate the local area, stoping off at the seaside area known as Bangara. A lovely little spot, we must be sure to return one day in force and subjugate the town. We then moved our operation to a local tourist attraction, where they produce a beverage called “Bundy”. All members of the troop and the recruit known as “Gangrel” were taken on a tour of the facility, and provided with samples of their product to test. 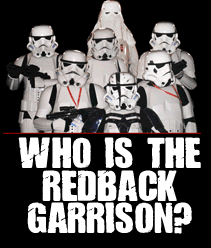 After a while, the barman departed for a short time, and the Redbacks took control of the facility, and the bar. (See photos). When it was time to leave, many of the troopers purchased some of the product for future use. The shuttles then departed for home base, stopping once at a northern town for food once more. Injuries : The usual small armour bites, although heat was a problem. No other problems were reported, although the water may have been a little cold for Sandman’s liking, from what we saw. Malfunctions: Sniper had a near complete malfunction of the strapping system that holds up the bottom half of his armour, as a result of sitting in the car on the way to the Hospital. No other faults were reported. Mission Status: Completed! Word of the Empire has been spread to Central costal Queensland, and our recruits in the area have been suitably briefed. Photos: Have been uploaded to the Photobucket web site here… More photos to come at a later stage as they are obtained. This entry was posted on Saturday, November 21st, 2009 at 12:09 pm	and is filed under Mission Reports. You can follow any responses to this entry through the RSS 2.0 feed. Both comments and pings are currently closed.